Chirpy Netherton United managed Jon ‘Abbas’ Harrison has no doubts his side can topple Peterborough Premier Division title favourites Oakham at the Grange on Saturday. 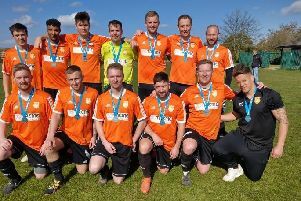 The Rutlanders were dubbed the best Premier Division side knowledgeable Pinchbeck boss Ian Dunn had ever seen earlier this season, but Harrison insists his side will prove to be even better. Third-placed Netherton start the match eight points behind second-placed Oakham, but with two matches in hand. Leaders Coates are two points clear at the top, but they’ve played three more games than Oakham. “I’m confident that we are now a better team than Oakham and I don’t mind saying it,” Harrison enthused. “I’m aware of what Ian Dunn said, but then he hasn’tseen us play lately. “I believe we are favourites to win this game and then we will have a great chance of winning the league. “We’ve played some great football in my short time in charge. We’re playing with great freedom and I am sure we will beat Oakham. “We lost at their place 2-1 earlier in the season, but we were the Rag-Arse Rovers that day. We had injuries and took a bare 11 which included me and I wasn’t fit and yet we still led for 75 minutes before losing to the last kick of the game. Netherton warmed-up for their big game with a 2-1 win in the quarter-finals of the President’s Shield, the Premier Division’s League Cup competition which the city side won last season. Ben Daly and Scott Taylor scored the goals for Netherton. Netherton will now play ICA Sports in the semi-finals in the new year. ICA beat Stilton 4-3 on penalties following a 1-1 draw secured by Joshua Smith’s 89th minute goal. Ashley Jackson scored one of ICA’s penalties. He left Netherton for ICA last week. Coates moved back to the top of the Premier Division as Danny Dance scored twice in a 3-2 win at Sawtry.